Plot. Ingresos: 2. Iniciativa: 3. Conquista: 1. Reserva: 6. Límite por mazo: 2. 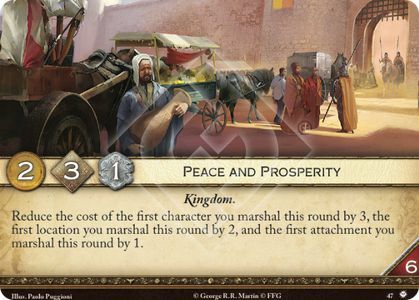 Reduce the cost of the first character you marshal this round by 3, the first location your marshal this round by 2, and the first attachment you marshal this round by 1.